This adorable Personal Emergency Pouch (PEP) is all handmade, velcro for easy opening and closing (no zippers to worry about); 8 items included - 2 sided mirror (one side magnified), 4 ounce bottle of aloe vera skin lotion, La Cross tweezer and eyebrow brush, 1 orange stick, a flashlight, a Ruby Stone nail file and a Blistex. It measures 9 inches wide and 6 inches in height. It is expandable. Add some of your favorite items, have everything at your fingertips right in the glove box of your car or truck! The Original Atlas Gloves are made with a tough Nitrile coating, a breathable nylon liner, machine washable, great for the flexiblity you need for any job requiring gloves, comfortable and extremely durable. The colors are pink (aas shown), purple, light green and sky blue. These Best in Breed Goldens are a wonderful addition to any household. Taffy the Lap Dog is $83.99; Copper, the Footrest is $139.99. Handmade in the USA. Please specify which of the 3 items you would like to order. Please allow 4 weeks for delivery. Items in this group are sold separately. If interested in purchasing entire grouping, please email me. This wonderful, humorous Butler Bear is handmade in the United States. It will be the talk of your next gathering, not to mention another pair of hands! Please allow 4 weeks for delivery. Enjoy this adorable holiday reindeer footrest year after year. Handmade in the USA. Please allow 4 weeks for delivery. Here is an adorable reindeer for your weary feet. Handmade in the USA. Please allow 4 weeks for delivery. This adorable Polar Bear Wreath is 30 inches wide. Wonderful for a door or wall. Handmade in the USA. Please allow 4 weeks for delivery. How about these cuties! Lily the Doorstop is $109.99; Moriah the Lap Dog is $83.99; Shadow the Footrest is $139.99. Wonderful additions for your home. All handmade in the USA. Please be specific when ordering. Items will be sold separately. If interested in the entire Black Lab Collection, email me. Allow 4 weeks for delivery. You too can have this beautiful tree climbing polar bear in his/her Christmas outfit. Standing at 40 inches tall, this will be a wonderful addition to any decor. Handmade in the USA. Please allow 4 weeks for delivery. The Original Black Bear Animal Footrest offers a perfect spot for your feet. Handmade in the USA. Please allow 4 weeks for delivery. The Original Hampshire Pig Animal Footrest offers a perfect spot for your feet. Handmade in the USA. Please allow 4 weeks for delivery. The Original Moose Animal Footrest offers a perfect spot for your feet. Made in the USA. Please allow 4 weeks for delivery. The Original Suffolk Sheep Animal Footrest offers a perfect spot for your feet. Please allow 4 weeks for delivery. Spring is here! Start your planting early. There are 8 seed balls per package. Each is loaded with seeds and will elicit clusters of flowers. They are hand-rolled by people with disabilities. Spring is here! No better time than to plant seeds and watch your garden grow. There are 8 seed balls to each package. 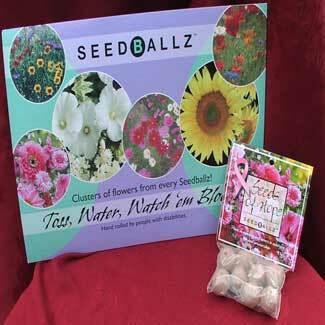 They are loaded with seeds; each ball will elicit clusters of flowers. These seed balls are handrolled by people with disabilities. This garden kneeler/seat is made of metal, is very sturdy, folds easily for storage. It has cushions on both sides for kneeling and sitting. Great for gardner with knee or back problems! (($1.00 added for drop/ship). An old remedy used for keeping snails at bay. This 15 foot roll of tape is 1-1/4 inches wide, and can be wrapped around trees, planters and pots. Can also be tacked into wood. Sold in packs of 2. ($1.00 added for drop ship). The Wheel Easy is much lighter than a regular wheel barrow and more maneurverable. It can be set down flush to the ground for easy loading. Also folds for storage. ($3.00 added for drop/ship). Make gardening easier - ergonomic garden tools puts less strain on muscles and joints - great for any gardner with arthritis or carpal tunnel syndrome. Foldable handle, heavy steel construction with chrome finish. ($1.00 added for drop ship).